A Honda Extended Guarantee is a great way to protect your car when your manufacturer’s warranty expires, which can extend the life of your vehicle. 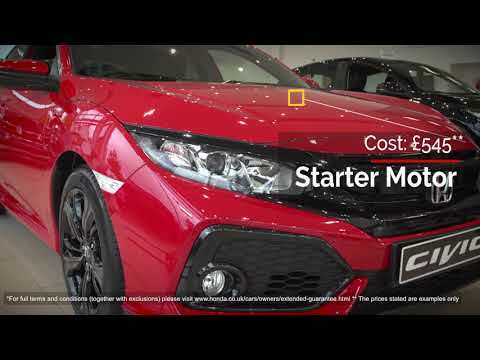 You have a choice of when you can take out your Extended Guarantee, either: when the 3 year or 90,000 mile manufacturer’s warranty expires or, if you have bought a Honda Approved Used Car and your 12-month Guarantee has expired. A Honda Extended Guarantee can help maintain ongoing service history, with genuine Honda parts, which could help you to improve the resale value of your car in the future. Full UK and European breakdown cover. Genuine Honda parts fitted by Honda-trained technicians. If you are a used car owner, you can extend your 12 month Honda guarantee by up to 2 more years with no mileage limitations. Our Honda Extended Guarantees are a unique customer care products that are only available from an Authorised Honda Dealer.